Float/Race begins: Saturday, October 5 at 6 am: Registration opens at 5 am at Westport Boat Ramp and Park. Float/Race ends: at West Point Veterans Park, a few yards down river from the confluence of the Salt River. 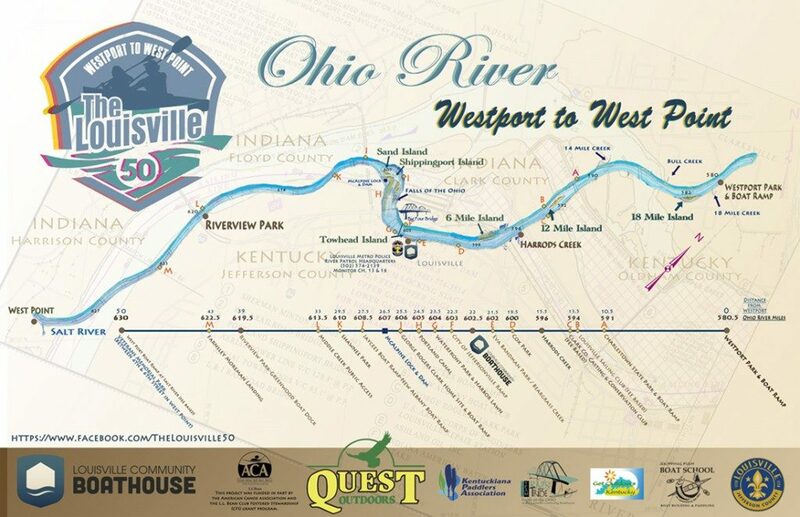 To promote safe boating on the Ohio River from Westport to West Point Kentucky. To showcase appropriate gear and strategies necessary to travel 50 miles on the Ohio. To promote instruction, community and physical endurance . To promote the creation and maintenance of paddlesport / boat ramps and camping sites to enable access and support for Ohio River Recreation enthusiasts. while increasing connectivity between river communities. To increase connectivity between river communities. The Louisville 50 adventure race/float covers the Ohio River through Kentuckiana. Participants Should be ready for any weather, wind and waves of the Ohio River. Participants should have experience with self-supported adventures on the Ohio River. Entrants can do the entire 50 miles or any segment, provided they check in one of the three checkpoints. The Louisville 50 is a self-supported adventure. Participants are responsible for their own navigation, safety, water, food, boats, paddles, lights, self-rescue abilities, communication systems and any training and or other equipment that they would need to be safe and legal on the Ohio River. Participants are responsible for having a shore team that will support them and be available for pickup during the day if that becomes necessary, as well as providing their shuttle from take out to their vehicles.Volunteer staff will be available to record your time and or provide an orientation for those starting or finishing at the specified check points. Vizit the Louisville 50 Facebook page for information.